In a brightly lit room at the William Pitt Union, the Pitterest crafting club gathers on a Thursday night at round dining tables covered with yarn, ribbon and other supplies. Abby Sites, an anthropology major and vice president of Pitterest, has seen the club grow in the past year and a half from about 15 to the 100 members registered this semester. With the increasing popularity of crafting groups like Pitterest, Pittsburgh’s artsy streak has continued this fall with new groups and projects leading up to this weekend’s Handmade Arcade, Pittsburgh’s largest independent craft fair, in the David L. Lawrence Convention Center. Last year’s event housed 160 vendors and 8,500 attendees. In the past decade, there has been an increase in hands-on art shops alongside the city’s many art galleries. Some include new pop-up workshops that feature themed projects for participants, while others — such as Fireborn Pottery Studios and Pittsburgh Glass Center — have been in surrounding neighborhoods for years. The rise of Pittsburgh’s crafting culture coincides with a national upswing of interest in artsy products and planned events for people to develop and experiment with their crafts. This includes adult coloring books, planned private painting events like Painting with a Twist and the popularity of the social media platform Pinterest, where users often share images of crafts and instructions for how to recreate them. 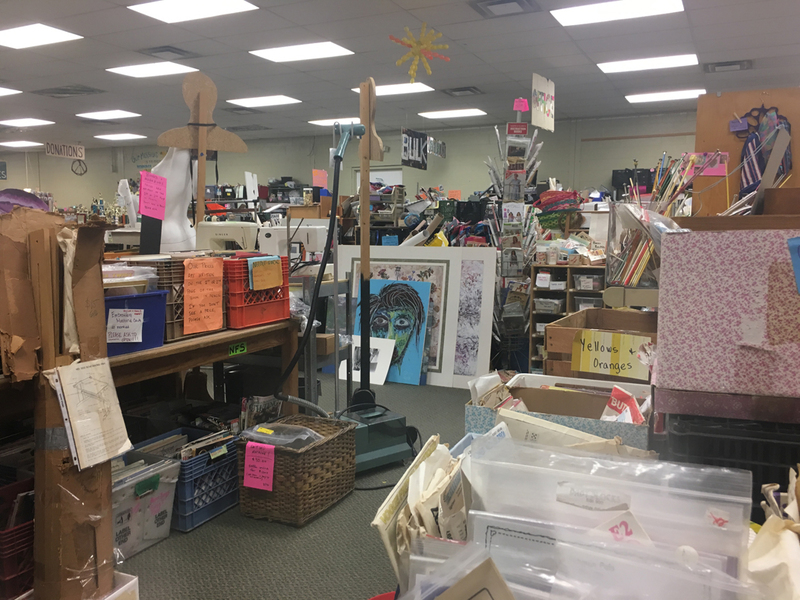 In keeping with students’ need for a creative outlet, Pitt launched its own Center for Creativity this fall, located in the basement of the University Store. The center, a product of last year’s Year of the Humanities, is a space for working on projects ranging from coloring, painting and sculpting, to music production and writing on a vintage typewriter — and all the necessary supplies are provided. The space, with tables covered in crayons and colorful shelves filled with yarn and glue, looks almost like a daycare, only it’s for young adults. And maybe that’s the point. In recent years, the line between art and craft has blurred, as people just looking for artistic ways to relax meet serious crafters, who produce works of art designed from craft materials. Pittsburgh itself has joined the two separate genres — “serious art” with arts and crafts — with installations such as the 2013 “Knit the Bridge” display, when crafters covered Andy Warhol Bridge in knit patterns. Brady works at the nonprofit Center for Creative Reuse, located on North Lexington Street in Point Breeze just off the 71C bus route from Oakland, where visitors can, for a small fee, use donated art supplies and home objects to repurpose for craft projects. Now in her fifth year at the center, Brady said working at the center allows guests to discover old belongings and make them into something new, much like a hands-on flea market. “You’ll get a box and piece together someone’s whole life,” Brady said. The Center for Creative Reuse features monthly workshops such as “Creative Conundrum” to promote creative expression and make use of hard-to-use materials, such as bubble wrap, cardboard boxes and VHS tapes. One of Brady’s coworker’s, Althea Denlinger, just completed her first summer with the nonprofit. Alongside the popularity of the Center for Creative Reuse’s programs, new startups keep joining Pittsburgh’s craft scene. The newest, Steel City Fiber Collective, is located on Ellsworth Avenue in Shadyside. Founded by four women — Anna Sylvester, Becca Kreiger, Cheryl Koester and Nora Swisher — the shop made its debut this past June. Steel City Fiber Collective sells finished projects from students and other locals, along with teaching classes. It specializes in knitting and weaving, teaching customers and providing an open space to work on personal projects. Nora Swisher, one of the founders, is a grad student studying physics at Carnegie Mellon University. Due to the proliferation of various kinds of fiber arts shops in Pittsburgh, from yarn to fabric, she said she’s not sure if Steel City Fiber would be successful elsewhere. Shops like Steel City Fiber prepare for festivals where artists and crafters can come together to present their work. CRAFTED 2016 took place on Nov. 4, at the Society for Contemporary Craft in the Strip District. Residents and students can learn these skills that vendors promote through pop-up workshops like the one done by Pop Craft, founded by Mount Washington resident Monica Yope in 2008. The “maker workshops” are housed in local bars and restaurants, and participants walk away with their art that evening. There are two featured holiday pop-up workshops on Nov. 28, and Dec. 4, using reclaimed wood to create tree decorations. For $42, all supplies are included, as well as food and drinks. Crafting culture is just as big on campus, where there are several student groups that have taken the initiative to focus on art and crafts, including Pitt Knits and Pitterest. Started through Student Affairs, Pitterest is headed by Monica Morrison, a student in the School of Health and Rehabilitation Sciences. Focused on DIY projects and themed activities, the club’s mission is to promote a stress-free outlet for students. Catherine Meissner, a nursing student, serves as the creative director by organizing project ideas and purchasing materials. Recent projects have included dream catchers, wall hangings and corkboards. Next meeting, the group looks to make ornaments for the holiday season. “We buy all the materials, they come and we try to make [the project] in about an hour, and as low stress as possible,” Meissner said. From Pitt organizations to off-campus resources, each of Pittsburgh’s crafting centers aims to adapt the local art scene to residents. “We try to be as involved with the community as we can, because that’s obviously a part of our mission,” Brady said.